It’s been a busy week for Springwell RC with members taking part in prestigious marathon events in Boston and London as well as high profile local events including the Bay Road 5k and the Newcastle AC Hill & Dale Series. Inspired by the revival of the Olympic Marathon in the 1896 games in Greece the Boston Marathon was first run in April 1897 when 15 competitors finished the race. Since then it has firmly established itself in the running calendar as the oldest continuously running marathon, taking place on Patriots Day, the third Monday in April, each year. Originally run over a 24.5 mile course the race was lengthened in 1924 to 26 miles 385 yards to conform to the standard set at the 1908 Olympics and codified by the IAAF in 1921. The Boston Marathon is considered one of the more difficult marathon courses because of the Newton Hills which culminate in ‘Heartbreak Hill’ near Boston College. While the Commonwealth Avenue hills are better known Race Director, Dave McGillivray would say that the climb from the Charles River crossing at 16 miles, is the courses most difficult challenge, as it follows a 150 ft drop over a half mile stretch. Amongst the 30,000+ competitors this year was Springwell RC’s Paul Thompson as he took on his 11th marathon. 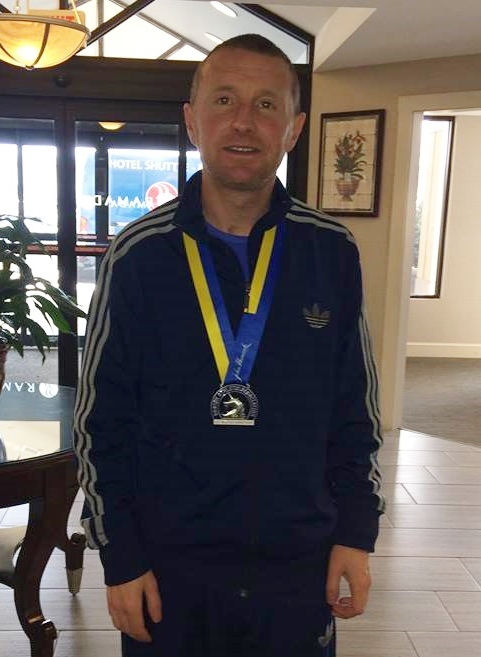 Having run a personal best of 2.50.11 in the 2017 London Marathon Paul was well placed to qualify for a place in this year’s Boston Marathon and despite his assertion that he was just going to enjoy the event there is no doubt that he produced a fantastic performance. This year’s race had the worst weather for over 30 years with the temperature below freezing for the entirety of the race and competitors having to cope with driving rain and a biting wind. There are not many world majors’ events where you see the elite athletes take to the start line in hats, gloves and rain ponchos but that was the case this year in Boston. In fact the majority of the field were dressed for the weather. Not Paul. The Portrush man took to the start line in shorts, vest and running shoes and, in a race that saw many runners, including race favourite Galen Rupp withdraw from the course because of the conditions, ran a brilliant 2.51.47 to finish 697th. Almost a week later on the other side of the Atlantic and marathon runners have to cope with soaring temperatures as over 40,000 runners gathered in London on 22nd April for the 38th London Marathon. Springwell RC had 11 runners taking part in this year’s event. Amongst them was Andrew Kincaid, who was at the start of a challenging undertaking in his charity efforts to raise much needed funds for multiple sclerosis. The London Marathon is the first of four marathons that he will undertake in the next five weeks with his next being Newport, Wales on the 29th April, Belfast on the 7th May and culminating at Edinburgh on the 27th May. As well as our senior athletes we also had two of our junior section, Hermione Skuce and Niamh Carr in London as they had been selected to represent Team NI in the London Mini Marathon. Conor Bradley (City of Derry AC) and Ciara Toner (Springwell RC) were worthy winners as over 100 competitors took part in this year’s Bay Road 5k, an event hosted by City of Derry AC. Despite the very blustery conditions, Conor broke the course record of 15.12, which he had previously held with North Belfast Harriers’ Mark McKinstry as he led the field home. The Spartan track star ran a fantastic 15.04 for 1st place, finishing just five seconds ahead of team mate Declan Reed (City of Derry AC), who crossed the line in 15.09. Mark McKinstry ran 15.12 for third place to equal the previous course record. In the ladies race, 9 ladies went under the 20 minute mark, with 6 of those dipping below 19 minutes, in what was a quality race. In-form Springwell Running Club athlete Ciara Toner ran out victorious, winning in 17.48. NI & Ulster 10,000m Champion Marina Murphy (Derry Track Club) followed in 18.04, before North West native Sarah Lindsay, of North Down AC, crossed the line in 18.13 for 3rd place. Springwell RC Results - 13th Rhodri Jones 16.45, 24th Alex Brennan 17.34, 26th Barry Mullan 17.43 PB, 27th Ciara Toner 17.48 (1st lady), 31st David O'Neill 17.57, 35th James Stewart 18.11, 38th David McAfee 18.24, 41st David Jackson 18.33, 46th Alister Jamison 18.55, 53rd Maurice Walker 19.20, 69th Will Colvin 20.36, 106th Jim Platt.